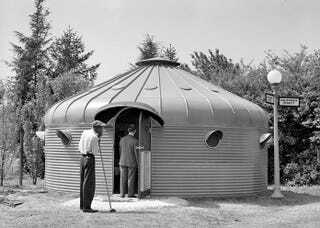 Buckminster Fuller's Dymaxion Deployment Unit—an emergency shelter developed during WWII—isn't his most well-known work. In fact, for years, it's been unclear if any DDUs still existed. But this week, The New York Times tells the story of a handful of shelters that have resurfaced, after being abandoned on an army base just 30 miles outside of NYC. Camp Evans, a military base in New Jersey, has been many things to many people: From a node on Guglielmo Marconi's global wireless "girdle" in 1917, to a vital R&D hub for developing radar during WWII, to a research base during the Cold War (Joseph McCarthy even suspected its employees of Soviet intrigue, calling it a "house of spies"). But by 1993, the base had closed—and the army was planning to sell the land and demolish everything on it. A local high school science teacher named Fred Carl had taken an interest in the site—and working with the National Trust for Historic Preservation, he managed to stay the army's hand. It wasn't until a few years later that he realized the provenance of the odd, circular shelters on the site. The monitoring station at Camp Evans received signals from the TIROS satellite. Image: US Army. So what were these mysterious pods, and why were they designed? The NYT reports that it all began on a drive through the American Midwest in 1940. Fuller took a liking to the metal grain silos ubiquitous across the Great Plains—and soon, he was collaborating with Butler Manufacturing Company, a major maker of the silos. Fuller imagined an emergency bungalow that was simple, inexpensive, and strong—a home that could be made quickly and airlifted to locations all over the globe. Butler began making these so-called Deployment Units in 1941—it was among the first of Bucky's designs to be mass-produced, according to MoMA. Images: Sebastian Kaal and the Buckminster Fuller Institute. DDUs were as much a product of WWII as the B-29 bomber: Its corrugated steel walls could be shipped flat and bolted together, and its windows were made from transparent plastic—a rare material at the time, mainly used in aeronautics. A fireproof curtain divided the circular space into individual rooms. Each DDU only cost $1,250, or roughly $20,000 in today's money. The Galveston Daily News ran a feature on the units under the headline "HOW TO BE COMFORTABLE THOUGH BOMBED," while The Winnipeg Free Press went with "A Shelter In War—A Beach House in Peacetime." Dozens—maybe hundreds—of the units made their way across the globe, but ironically, it was the war itself that doomed Bucky's project: Soon after the U.S. entered into the conflict, the government began rationing steel. Production was suspended. "A few hundred were put to use by the Army for medical operating rooms and Signal Corps housing," explains Butler on its website. Including the 20 or so that made their way to Camp Evans. Vintage computers on display at Camp Evans. Image via TomsPixels. Today, Fred Carl—who now runs a nonprofit dedicated to educational programming about the tech that was developed at the base called InfoAge—is working to restore and re-use the 12 remaining units. One is even being used as an art studio. Thanks, Alastair! Lead image: Sebastian Kaal and the Buckminster Fuller Institute.